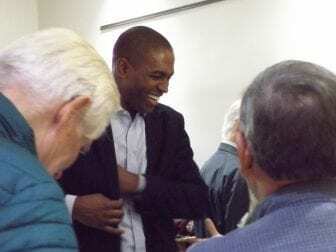 BINGHAMTON, NY (WSKG) – For Freshman Democratic Congressman Antonio Delgado, entering Congress during the longest government shutdown in U.S. history was frustrating. Delgado said it made it hard to focus on issues for his 19th district. Issues like rural broadband, opioids and infrastructure. The government has reopened while negotiations continue over funding for border security. If an agreement isn’t reached, government could shutdown again. Delgado’s district covers the Hudson Valley and Southern Tier, including Otsego, Delaware and part of Broome County. The Democrat said he heard from farmers seeking grants from the USDA, which were delayed, and from SNAP recipients who worry about having enough food. “I heard a number of stories that needed resolution quickly and at least we were able to get the government open and I do hope we can find a resolution in the coming days and weeks,” Delgado said. And if there is another shutdown? Delgado made the comments at the opening of his new district office in Delhi. He’s opened, or plans to open, a series of offices across the district, but doesn’t want to put an exact number on how many. That being said, he doesn’t want constituents to drive more than an hour or 90 minutes to visit one of his offices. The Delhi office at 111 Main Street will be open from 10 a.m. until 4 p.m. on Tuesdays and Wednesdays. It will also be open by appointment. On Thursday, Delgado will also open an office in Oneonta. That will be at 189 Main Street #500. It’ll be open Thursdays and Fridays between 10 a.m. and 4 p.m. and by appointment.